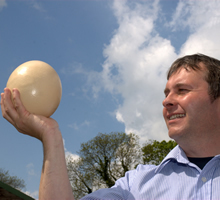 Ostrich eggs are the largest edible egg in existence today. Equivalent in volume to 24 chicken Eggs. An empty shell suitable for display, painting or carving.